Midwest Automotive Designs’ Weekender is built on the Mercedes-Benz Sprinter 3500 diesel chassis. 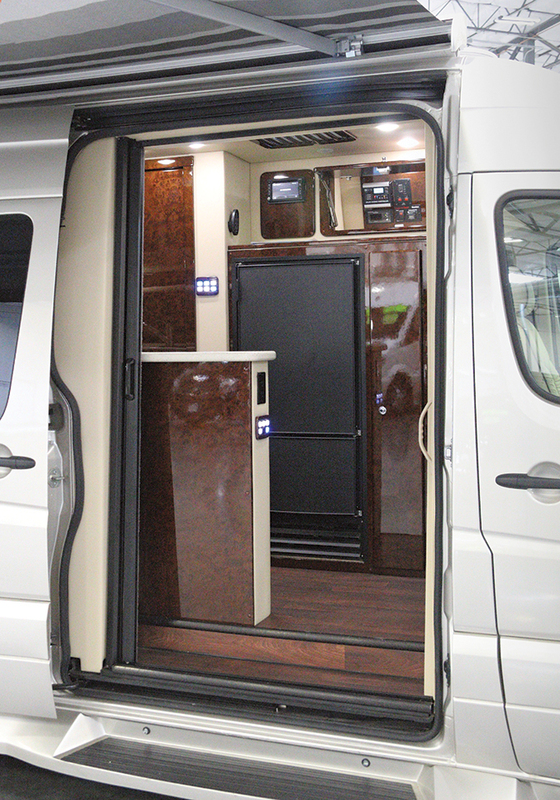 This custom van upfitter builds luxury vans and type B motorhomes on Mercedes-Benz Sprinter and Ram ProMaster chassis, including this top-of-the-line model. From 2004 to 2014, Midwest Automotive Designs, a custom Type B motorhome builder, sold its custom RVs factory-direct only. Each unit was designed, engineered, and built to individual client requirements. In 2014 company officials recognized they were at the threshold of expanding the motorhome business and would need a dealer network to do so. Today that network includes 50 Midwest Automotive Designs dealers nationwide. In 2017 the company was acquired by REV Group, an RV and specialty vehicle manufacturer. 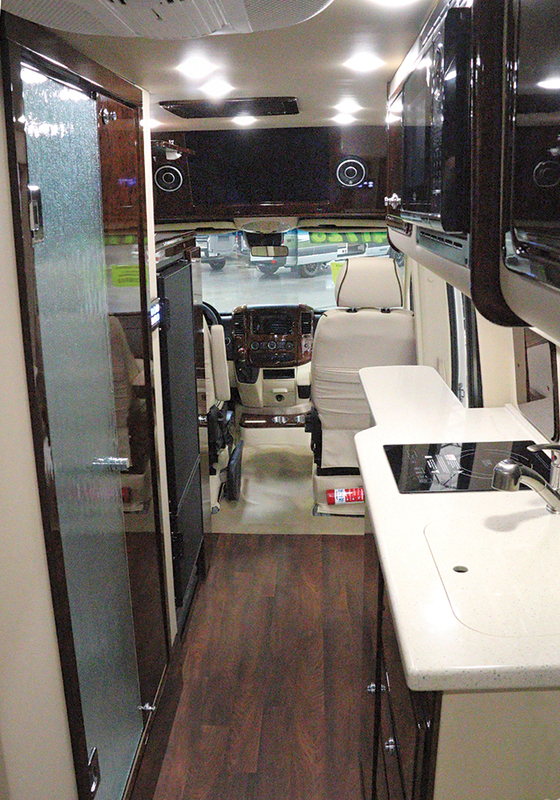 Midwest Automotive Designs’ Weekender Type B motorhome offers automotive-type features in the cockpit. 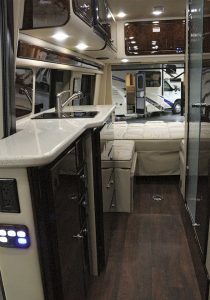 Midwest Automotive Designs offers four Type B motorhome lines: Passage; Day Cruiser; Legend; and its flagship, the Weekender. I took a close look at the latter model while visiting the recently opened La Mesa RV dealership in West Sacramento, California. Today Midwest Automotive Designs builds on the Mercedes-Benz Sprinter chassis and the Ram ProMaster chassis, though the Sprinter has been used since day one. 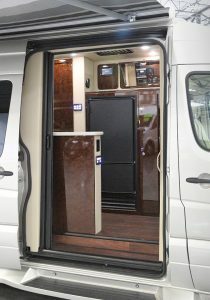 The Weekender is offered only on the Sprinter 3500 diesel. For approximately $10,000, any of Midwest’s Sprinter-based models can be equipped with a Mercedes-Benz factory-installed four-wheel-drive option. From Chassis . . . 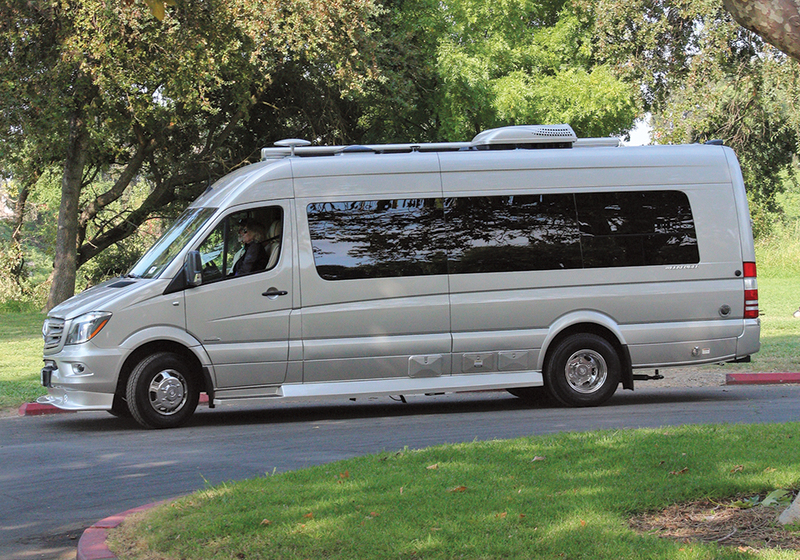 The Weekender’s dual-rear-wheel, two-wheel-drive Sprinter 3500 chassis comes with a 170-inch wheelbase. Two floor plans are available, including the MD2 that I inspected. Options on this particular coach included a Pearl Silver Metallic exterior paint scheme ($1,699) and a side and rear screen door package ($2,205). The base Weekender model comes well equipped, and the list of available options is relatively short. 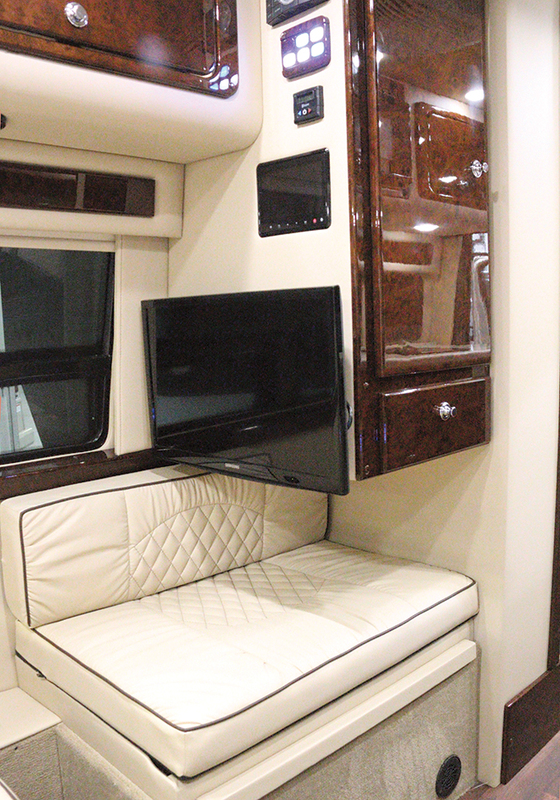 Rear doors open to reveal the review unit’s power sofa after it has been converted to a king-size bed. The 3500 is powered by the Mercedes-Benz V-6, 3.0-liter turbocharged diesel engine, which produces 188 horsepower. Its five-speed automatic transmission is controlled by a shifter in the center console. For the four-wheel-drive option, the transfer case also is designed and built by Mercedes-Benz. 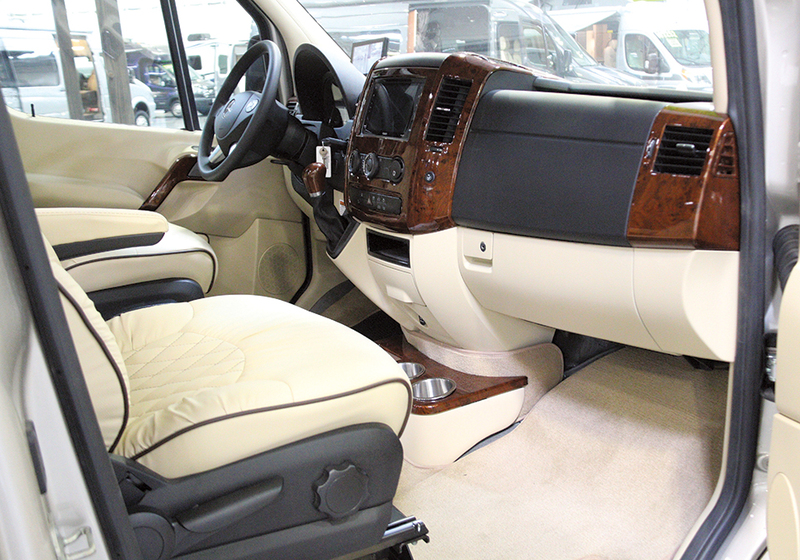 When so equipped, the coach can be shifted on the fly from two-wheel drive to four-wheel drive and back. The coach comes equipped with a Class II hitch receiver and a 5,000-pound towing capacity. The wiring harness electrically connects what is being trailered to the electrics on the Weekender via a seven-pin coupler. The Sprinter 3500 chassis incorporates a unitized, semimonocoque design. The rear axle comes with posi-traction. Front and rear suspensions feature shock absorbers. Midwest Automotive Designs is a certified Mercedes-Benz master upfitter. With that title, the company must comply with stringent quality control and quality assurance processes and procedures. Periodically, master upfitters are audited by Mercedes-Benz to verify that these requirements are being practiced. Not all RV converters receive this designation. The Weekender retains the original sliding side cargo door. 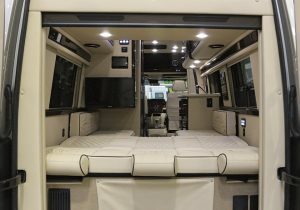 When a stock Mercedes-Benz Sprinter 3500 van is received at Midwest Automotive Designs’ Elkhart, Indiana, factory, the upfitting process begins for its conversion to a Type B motorhome. Inherent is a commitment to not violate the structural integrity of the van shell or chassis. The roof, walls, floor, rear doors, and sliding side cargo door remain the same as when the van shell leaves the Mercedes-Benz factory. Any penetrations made to the shell are minimal and are required to install additional windows, vents, exhausts, etc. The company does not use a production-line process. Instead, project teams of craftsmen and technicians, each with assigned duties, come together to build every unit. Many of these techs — plumbers, electricians, mechanical and structural engineers, etc. — remain with the vehicle from beginning to end. About 21 workdays are needed to complete a motorhome. However, the backlog of orders also factors in. When a dealer orders several units to place in its inventory (such as the Weekender I inspected at La Mesa RV), or an individual customer orders a unit with specific features, it takes four to six months before upfitting can begin. So, purchasing a unit from a dealer’s existing inventory may be an attractive alternative. When the upfitting, or conversion process, begins, the Midwest Automotive Designs crew installs the holding tanks below the existing floor (gray, black, and fresh water). Technicians then wrap the tanks in an electric-blanket-type material — an important part of making the Weekender a four-season motorhome. DC current is drawn from the coach’s house batteries to heat the tanks. Where applicable, heat tape is added to keep the plumbing flow paths protected from cold weather. The Weekender comes standard with a macerator dump system that processes the contents of the gray- and black-water tanks and pumps it to an appropriate dump site. Fabricated before the van shell arrives, the harness that houses the electrical wiring is installed along the inside of the walls. It carries 12-volt DC and 120-volt AC to support components throughout the coach. Insulation and interior wall treatments are added next. Insulating the Weekender is a twofold process, which involves adding two layers to the interior walls, ceiling, and floor. Two types of insulation are used, each yielding unique insulation characteristics. The first layer is a blanket of fiberglass insulation that provides a barrier against thermal transfer in both directions. The second layer is a foam type, which achieves two objectives. First, it augments the fiberglass insulation by providing an additional thermal barrier against heat transfer. It also intercepts the noise and vibration generated outside the vehicle, such as the road surface below, as well as sound created inside. This double layer of insulation also is added to the sliding side cargo door and the rear clamshell doors. Upholstery in the Weekender is offered in six colors and two stitching patterns. The company takes pride in manufacturing some of the quietest RVs on the market. In addition to the double insulation, interior wood pieces are wrapped with fabric and foam to avoid wood-on-wood grinding. A sound-dampening muffler is installed on every generator. Or an optional lithium-ion package can be selected to eliminate the generator altogether; more on this later. The windows that come with the van shell from Mercedes-Benz are retained, as they feature the use of a privacy-thermal reflective glass. Exterior automotive paint is applied at the Mercedes-Benz factory. Standard colors — black, white, and silver — typically are used, although Mercedes-Benz offers 23 other colors that can be special-ordered. Pearl Gray is one; another is a matte finish that recently has become more popular. Midwest Automotive Designs will add custom exterior graphics if a customer desires. All exterior claddings, trim pieces, grilles, and running boards are painted to match the exterior body color. All furniture and cabinetry are built in-house. The wood cabinets are multilayered and sealed to prevent moisture from migrating between layers. The only components and systems outsourced are electronics, appliances, plumbing, and the electrical wiring harnesses. The Weekender’s heating, ventilation, and air conditioning (HVAC) systems are worth noting. Standard A/C equipment is a 13,500-Btu roof-mounted Dometic air conditioner, which is ducted directly into the cabin. 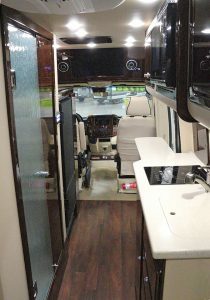 This unit is powered by an Onan 2.5-kw auxiliary propane generator that’s mounted beneath the floor, or via 30-amp electric when the coach is connected to shore power. : The curbside galley, opposite the permanent wet bath, features handcrafted solid-surface countertops and an induction cooktop. A European-style heating system called Espar comes standard. The Espar furnace draws diesel fuel directly from the vehicle’s 24.5-gallon tank. Propane runs the Suburban water heater and the Onan generator, which also are standard. A noteworthy option is Midwest Automotive Designs’ proprietary Pro Air system. This 12-volt, engine-driven system is mounted beneath the coach and includes an air conditioner and a furnace, each yielding 30,000 Btus. All that’s required is to set the interior thermostat. As ambient temperatures change, the Pro Air calls the air conditioner or the furnace into service to maintain the desired interior temperature. Some clients elect to eliminate the standard roof-mounted air conditioner when the Pro Air system is added. This eliminates the need for the auxiliary propane-powered generator. Some clients find it appealing that without the roof-mounted AC unit, it becomes more difficult to determine whether this vehicle is a passenger van or a motorhome. Another option takes the Weekender to the next level. Midwest Automotive Designs offers a lithium-ion house battery package, which is mounted beneath the floor. 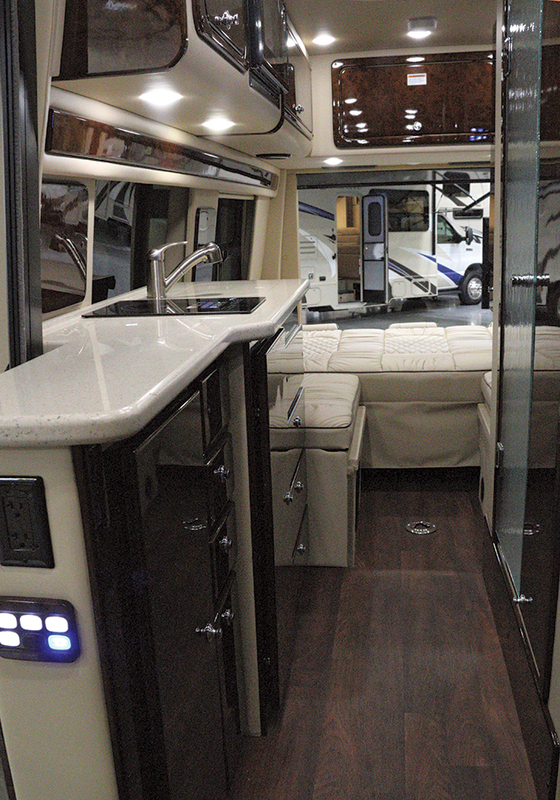 The lithium battery pack powers everything on the motorhome, including the Pro Air HVAC system. This enables the Pro Air’s heating and A/C systems to run silently. The coach can be parked anywhere, even where noise restrictions are enforced; the HVAC is said to be undetectable, even when operated at full capacity. According to company officials, the lithium battery pack can be operated continuously for up to 8 hours. In addition to building all of the furniture and cabinetry, Midwest Automotive Designs technicians also handcraft the solid-surface countertops. Instead of offering a limited number of décor packages, all of the colors, fabrics, and wood choices can be mixed and matched. Six interior wood selections are available. Furniture upholstery also is offered in six colors. Customers also can choose from two types of upholstery stitching. The stitching and fabric selections apply to the cockpit captains chairs as well, which are removed and rebuilt for this process. In addition, Midwest Automotive Designs is one of few manufacturers to dye the front dash to color-match the rear of the coach. Three sofa-bed configurations are offered. One is a twin-bed plan; another is a rear power sofa that folds flat into a king-size bed. The third sleeping option, recently introduced, is a king bed (positioned front to rear) that tucks up against the ceiling until it is put into service. At the touch of a switch, the bed lowers via a powered cogged track system. This makes it convenient to haul bicycles, kayaks, and other gear inside when the bed is not needed. It’s also a spot where kids can spend the night on a blow-up air mattress. Company literature states that the power sofa with living space underneath it is an industry first. 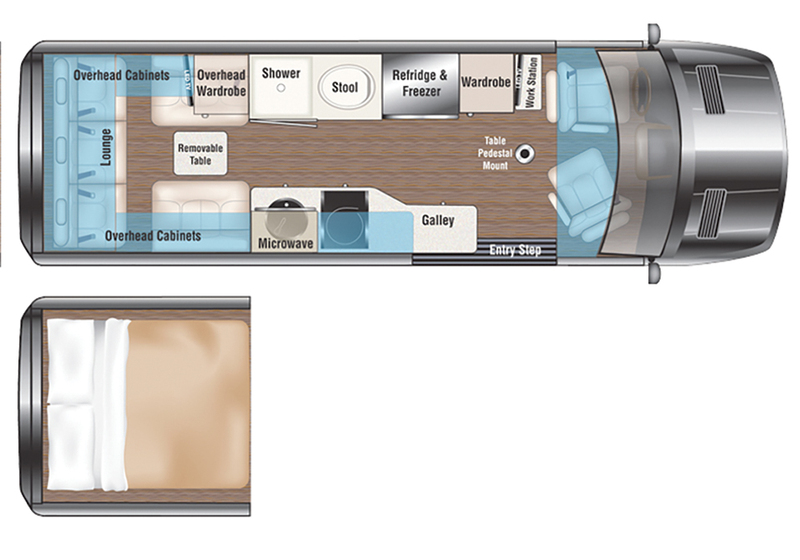 The Weekender is offered in two floor plans, with a rear lounge or rear dinette configuration. The MD2 comes with the two cockpit captains chairs. The MD4 includes a second row of cockpit chairs immediately behind the cockpit seats; these passenger seats can be removed quickly to make additional room for cargo. A removable table or dinette can be put into service when needed. 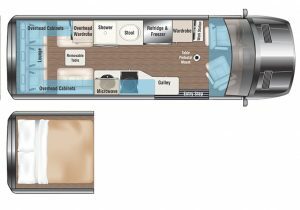 The galley features what many would expect in a larger RV: a two-burner induction electric cooktop, a two-way refrigerator-freezer, a microwave oven, and a galley sink. If the all-electric option is selected, an electric water heater is installed. Weekender floor plans contain full-service permanent wet baths with a marine-style porcelain toilet, a lavatory, and a stand-up shower. The unit reviewed featured a frosted-glass shower door. The bath also has a Fan-Tastic roof vent with remote, and a retractable clothesline. The Weekender includes deluxe multiplex lighting controls, a Samsung HD LED smart TV, and a rear Blu-ray DVD/CD player and AM/FM radio. In the front, the driver and copilot have access to Sirius XM satellite radio. The driver can utilize the four-camera viewing system with two monitors. USB 12-volt chargers are handy for charging today’s array of electronic devices. The manufacturer’s base suggested retail price of the Weekender is $149,900. The manufacturer’s suggested retail price of the unit I reviewed, with options, came to $157,065.